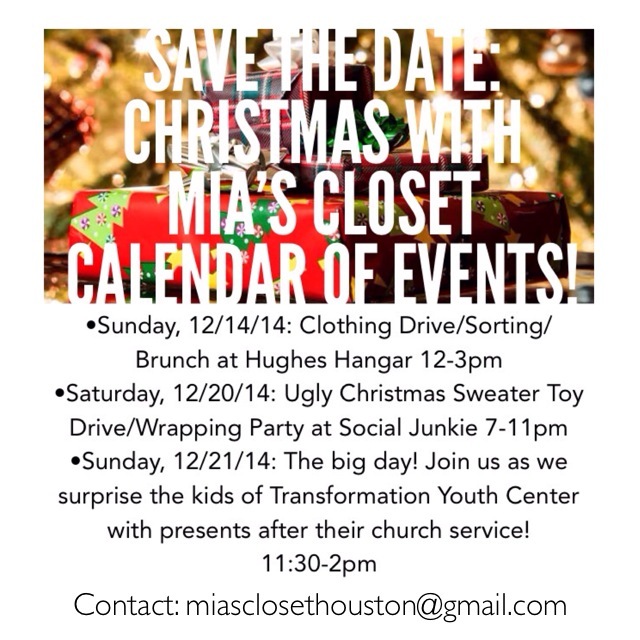 Volunteer Opportunities December 2014: Christmas with Mia’s Closet! Mia’s Closet is celebrating this Christmas season like never before! Every quarter we host an event where the kids receive free clothing, and each experience is uniquely designed for the group we are partnering with! Our next opportunity to do so is right around the corner! We’ll be surprising 200 kids from Transformation Youth Center with Christmas presents, and we’ve already received two huge donations! One from a resale shop that closed, another from Toys R Us and Top Vintage just signed on to partner! There are three ways to get involved, and we hope you’ll be joining us and spreading the word for all of them! « Mia’s Closet is looking for PR/Social Media Interns!